Does anyone know of specific locations of murals in Kolkata? Thanks for any tips. You may find it in Kolkata.....but on streets (as the heading of your thread says) are tough.....I saw it sometimes in front of the main gate of Academy of Fine Arts. You also may find street painters in Park Street, New Market or around KMC (Kolkata Municipality Corporation) areas, but I never saw them to making murals, but small portraits. Thank you PKanti -- If in your travels around your city, you should happen to see a mural, I would very much appreciate your letting me know. Thanks again. The murals can be found there. Actually the artists there create it by orders. If you have any plan to purchase it, you can get it by making an order. Otherwise, in Dugapuja festivals, Murals may be seen in 'Mandapa' in Kolkata and sub-urb areas. After the Puja over one can manage to purchase a murals in cheap price. Address of Kumartuli can be found very easy.......come to Kolkata and ask anyone. Obviously I am not referring to the pandal art, which you are talking about, PKanti. I am not talking about art made to order either. I am talking about spontaneous artistic creation on the wall - murals - which is free and classified as street art. I will post a photo so that you can better understand what I am talking about. Kumartuli is obviously easy to find. The exact location of this mural is not so easy to find. We were there last year with Kausik. Maybe he will remember! I took a lot of photos last time I was there of political slogans painted on walls. I'll look through my pictures again to see do I have any art too. Here's another photo, also snapped last year during the Durga Puja festival, but it refers to the Festival of Vishwakarma during which kites are flown and the caption (in Bengali) says "bo-kata", meaning (Yipee) "I have cut your string"... 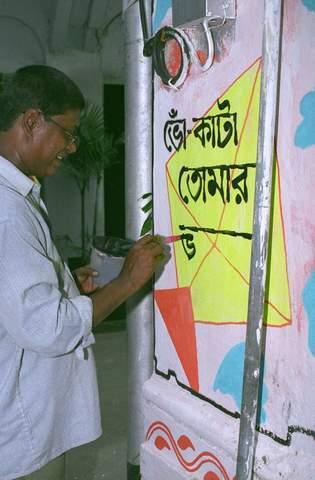 The artist is writing "tomar bhalobasha", meaning "with my love (to you)". Isn't it great? The bengali word is 'Swagatam' which means 'Welcome'. See the cat (or tiger??) is doing 'namaste'. Thanks to all posters -- this is exactly what I'm hoping to find as I wander around Kolkata. Will definitely make my way to Kumartuli. Any murals with locations would be so appreciated. 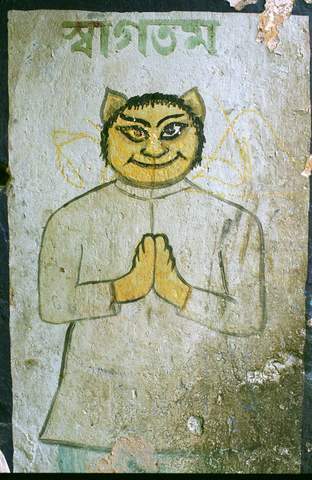 As an aside, is Kumartuli also the area where there are potters and stone carvers? ha ha loved it suricate. so true! !